Rather than those that made our lives hell, the Events section on Facebook has been mostly immune to any sweeping advancements. Today, that changes… at least for iOS users. Instead of an uninspired list of events that you probably have no desire attending, you’re met with a nice interface that lets you take on a sort of choose your own adventure role to mapping out your evenings or weekends. You can specify when it is you’re looking to get out of the house — whether it’s today, tomorrow, this weekend, or next — as well as just what you’d like to do. Sections include: music, food and drinks, nightlife, sports and fitness, fine arts and crafts, community, film and photography, performing arts and causes. 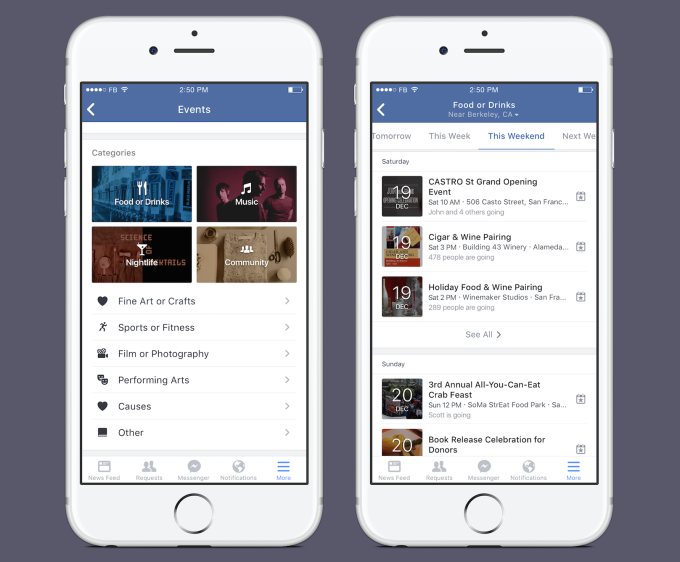 In addition, there’s a new “Suggested for You” section that algorithmically plans your dream night — or at least a pub crawl with dozens of drunk locals — based on the data Facebook has about you. The platform still isn’t perfect, but it’s a huge step in the right direction that could see Facebook eventually taking the lead in social planning in a much more intuitive way than services like, say, Eventbrite. But, overall it’s a huge improvement.